The quality of the blood-brain barrier (BBB), represented mainly by endothelial tight junctions (TJ), is now believed to be dependent on the brain microenvironment and influenced by the basal lamina of the microvessels. In the highly vascularized glioblastoma multiforme (GBM), a dramatic increase in the permeability of blood vessels is observed but the nature of basal lamina involvement remains to be determined. Agrin, a heparan sulfate proteoglycan, is a component of the basal lamina of BBB microvessels, and growing evidence suggests that it may be important for the maintenance of the BBB. In the present study, we provide first evidence that agrin is absent from basal lamina of tumor vessels if the TJ molecules occludin, claudin-5 and claudin-1 were lacking in the endothelial cells. If agrin was expressed, occludin was always localized at the TJ, claudin-5 was frequently detected, whereas claudin-1 was absent from almost all vessels. 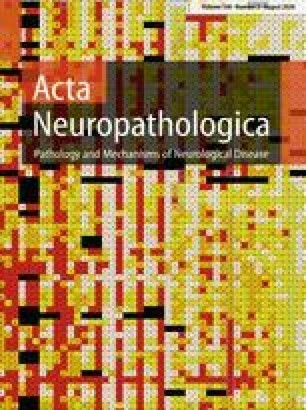 Furthermore, despite a high variability of vascular phenotypes, the loss of agrin strongly correlated with the expression of tenascin, an extracellular matrix molecule which has been described previously to be absent in mature non-pathological brain tissue and to accumulate in the basal lamina of tumor vessels. These results support the view that in human GBM, BBB breakdown is reflected by the changes of the molecular compositions of both the endothelial TJ and the basal lamina.